Yes, egg shells! 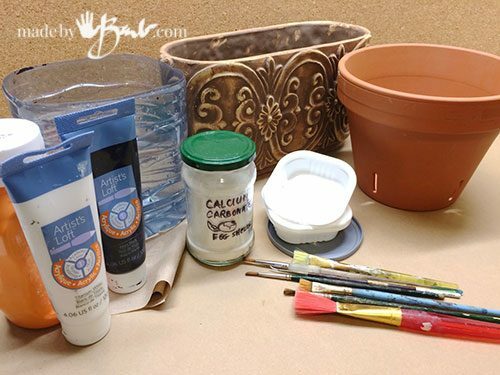 Did you know that you can make your own chalk paint?! 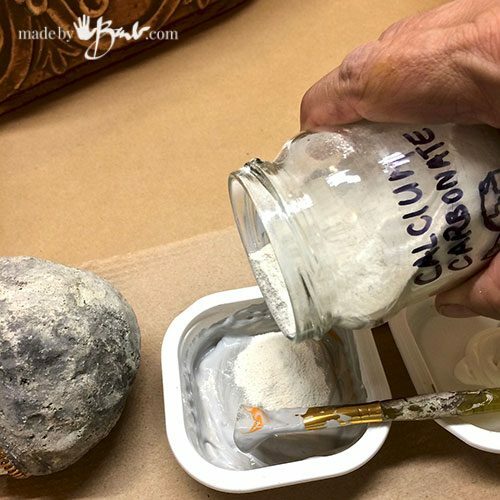 It is just a matter of adding calcium carbonate powder. 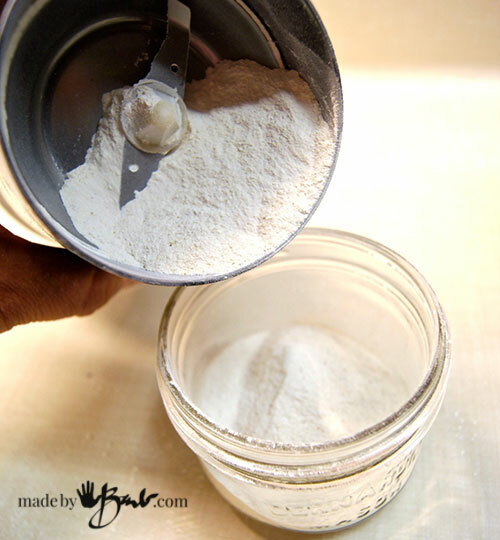 I have in past bought my powder it at the wine-making store. You can however also make it yourself. 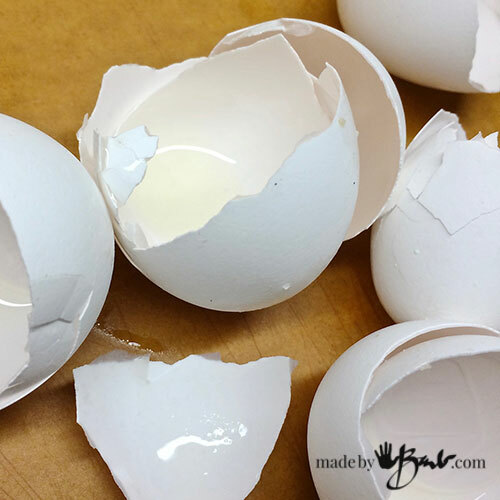 Collect some egg shells, wash them, let them dry. To grind them I used my coffee grinder. I have the intention of using this powder in my paint for the projects that need a good coverage. I did notice that the coffee grinder did not grind it as fine as what I had bought. However for this purposes it is perfect! 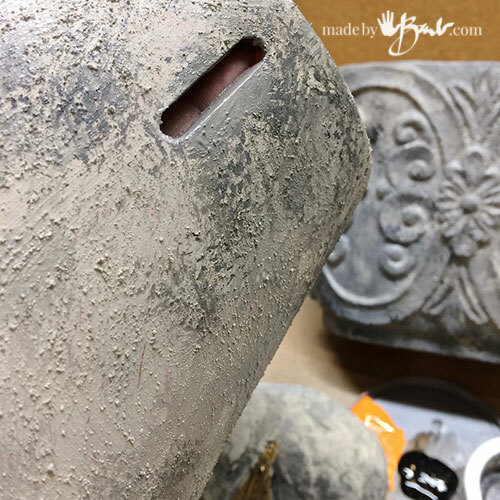 Make sure that your object is ready for paint. 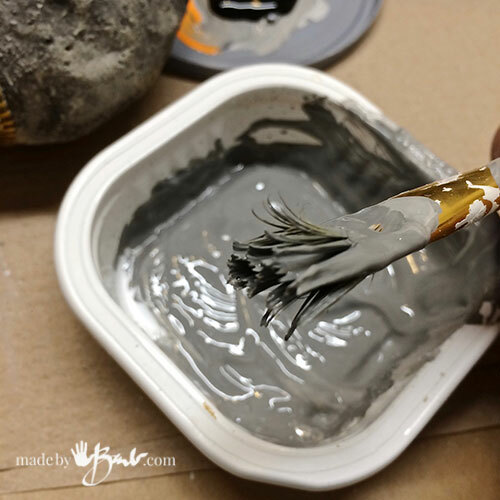 If you are using something that is very smooth or shiny (even plastic) give it a good scuffing with rough sandpaper so that the paint has something to adhere to. Add a good helping of the calcium carbonate. 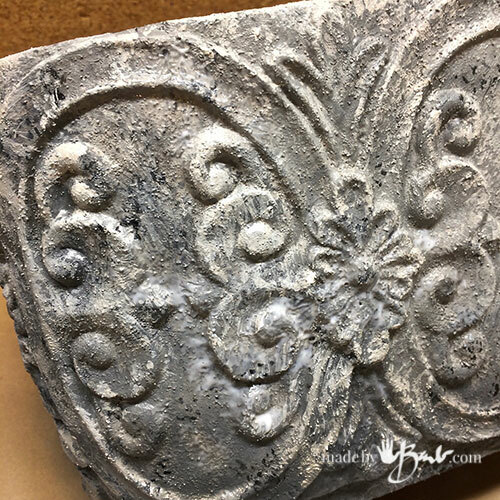 It can be quiet thick as you want to add some texture to your object. This is quite a ‘forgiving’ treatment and does not need to be fussy. I like to use my old brushes that almost end up like scrub brushes. Cover the entire object with a ‘scrubby’ coat. 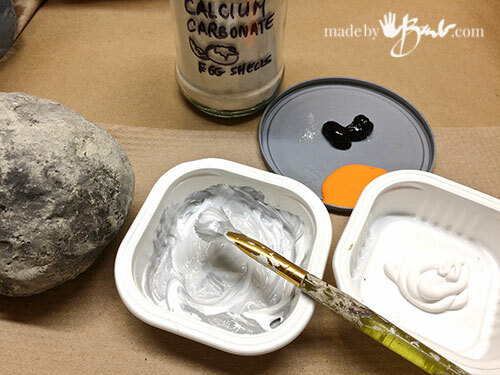 Mix another gray, this time a bit darker and add calcium carbonate again. Also add some orange to the mix. This time in order to give it the concrete variations, only dab on with a ‘scrubby’ brush. If need be wipe some off. 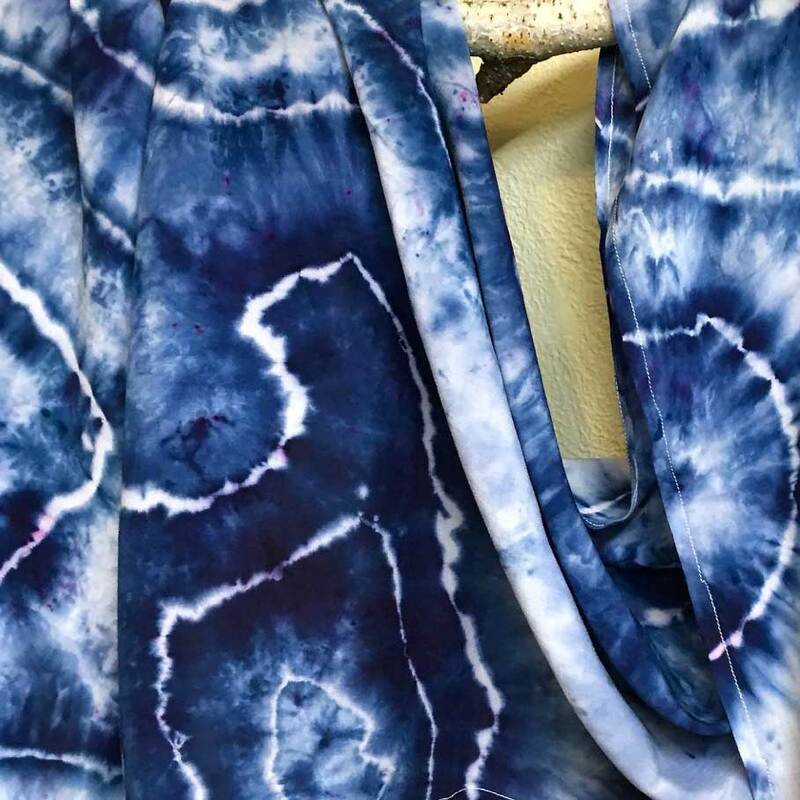 It should look quite mottled and rough. 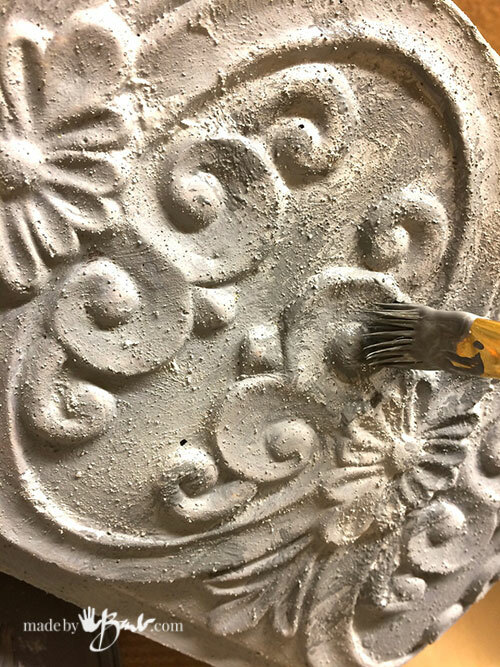 The larger particles in the calcium carbonate will look like the sand of the concrete; perfect. 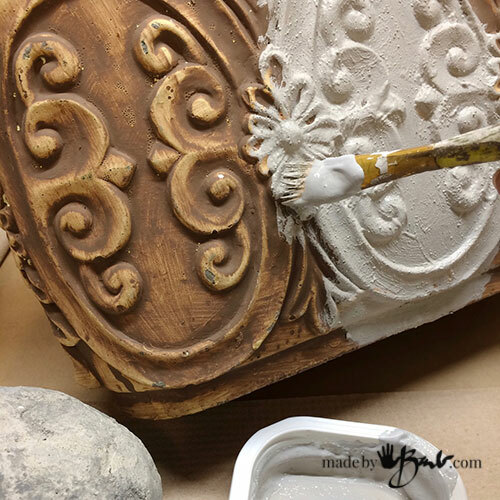 If you prefer an even more antique look you could also give it another wash of a thin runny paint to darken all the crevices and wipe off. This will accentuate the texture similar to aging. Concrete usually has a lot of tiny imperfections, little holes/bubbles. To give the look of those use a scewer or toothpick to add tiny little dots to be the ‘holes’. 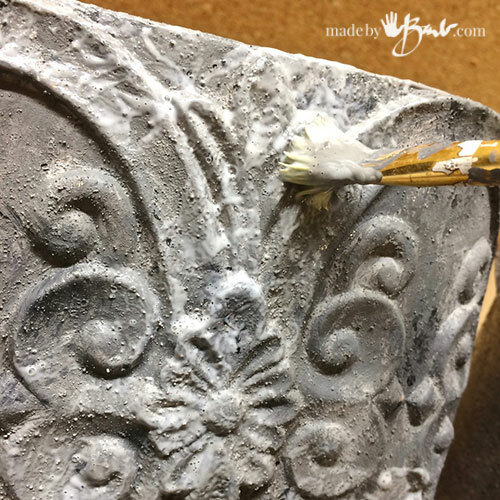 This Faux Concrete Paint Finish can be applied to anything. It will however look more convincing if the shape has character for concrete. 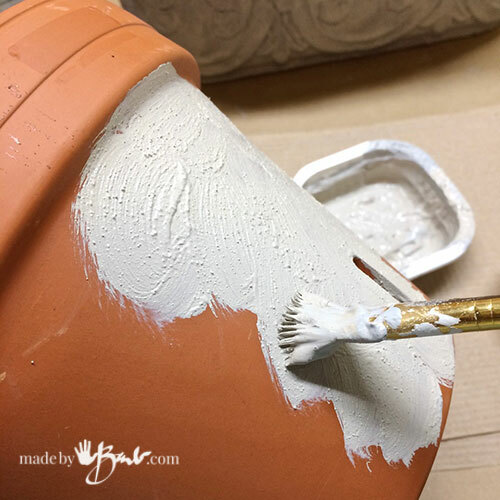 Clay pots work great since they are very porous and paint will adhere well. Oh, that silly smile! 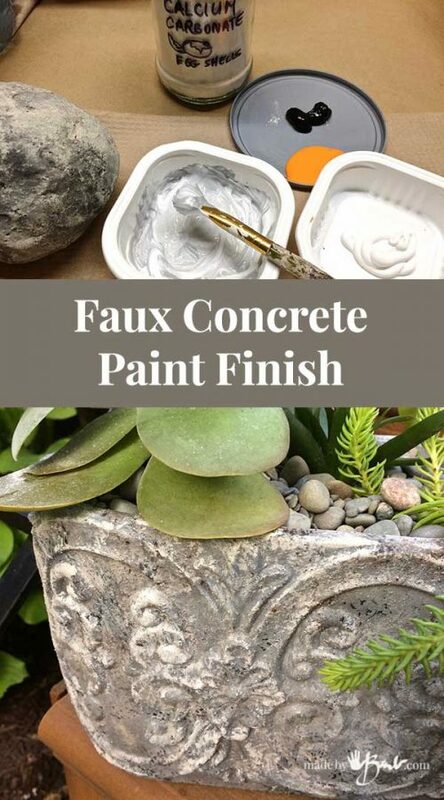 This is a great and easy way to make a few different planters all match. But it is not limited to planters, this could be applied to many things. I have a weakness for succulents lately! Why? They are quite happy even if you forget about them. They also propagate so easily which when you make as many planters as I; you need things to fill them. 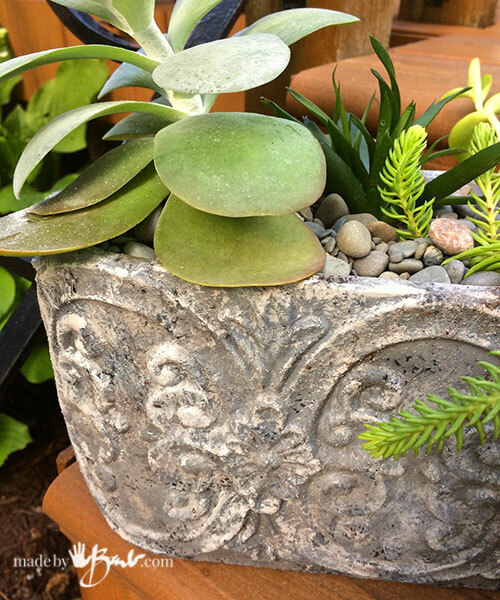 Huge Paddle plants are great in ‘concrete’ planters! 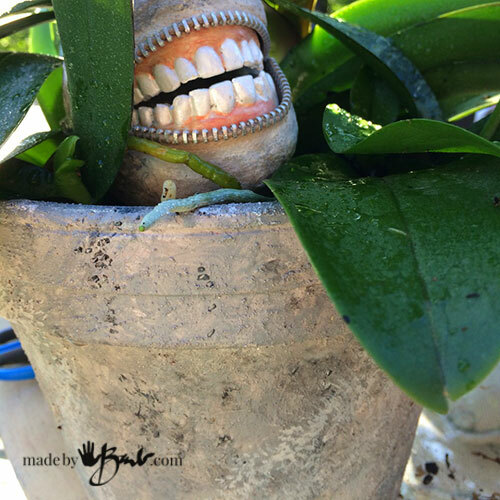 Love this – really looks real – those teeth are pretty funny too (and all the textures). 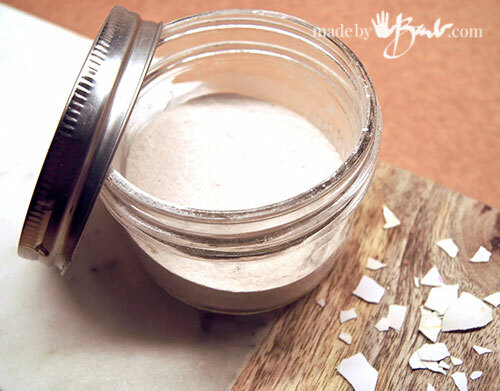 … pulverized eggshells can be thrown in a smoothie too, from what I understand, for extra calcium. Seriously! 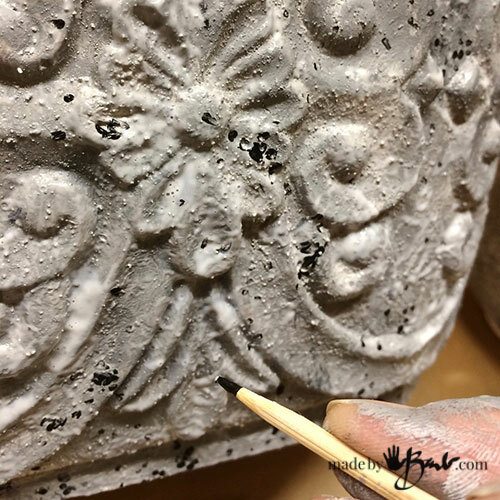 Nice work….You can also use tile grout mix in lieu of calcium carbonate – just as you can add non sanded version to latex and make chalk paint. Old ugly lamps! Cover with concrete? Thank you! Great! Another way to keep them out of the landfill! You could also consider making them into this sparkling idea! You have me hooked. I signed up for your news letter. I love learning and doing projects. I am so glad! ‘Nice to know it’s all worth it!